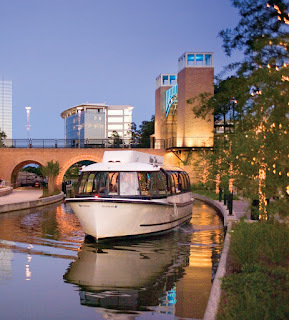 The Woodlands Convention and Visitors Bureau (CVB) was challenged last year with the responsibility to make the expensive water cruisers cost-effective for The Woodlands taxpayers. Today the CVB announced that the bureau is now accepting business proposals for their use as catered meal vessels on the 1.5 mile waterway. In the proposal, there is room for a variety of related business models including multiple business establishments overseen by an umbrella business. This could be an exciting time for our community if we can find creative thinking in the catering industry to build a profitable business with them, a possible win/win for residents and businesses alike. This initiative is aimed to provide a revenue source to offset expenses of the boats' maintenance and operation. An RFI (Request for Interest) has been issued for sponsorship of all six cruisers including name and advertising. The scenario is that three of the boats will continue to be used for waterway transportation, principally tourist rides. The other three will be used to provide catered meal services, part of the original vision for these water taxis. Currently, two of the boats are equipped with tables and one is not, of the three to be used for catered services. Twenty people can be seated in each of the two boats with tables and 80 can be seated in the third without tables. The boats will be ready for operation about April of this year after refurbishment, scheduled to begin very soon. Any business venture interested in this opportunity can contact the Woodlands CVB. Please refer to the link below for additional details and contacts.